Have you ever noticed some additional links shown at Google Organic Search Results while you searched for something on Google. You will find Google will show sub-pages/URL's along with main domain for top ranking website. Sitelinks are these additional links which Google show's at search engine result page's for #1 ranking website, while many times Google also shows Sitelinks for top-10 ranking websites. Above screenshot show's how Google show's website sitelinks, I believe all those who were not aware now knows what are Sitelinks and how it shows at Google. It is important for you to try get your website internal page's get picked by Google and displayed as Sitelinks by making your website navigation user and crawler friendly. Google show's Sitelinks only when their algorithm finds internal webpage URL's qualifies to get displayed as Sitelinks based on navigation which has to be easy for user's, provide easy access to crawler etc. The purpose of showing Sitelinks is purely to help online user or searcher to easily jump on relevant webpage at one click. As said your internal website page's will qualify to be shown as Sitelinks only when they qualify Google standard's of which important one is your own website navigational structure which often many webmaster's ignore. In order to help Google find the page's you want to be included as Sitelinks, you need to link all such page's on your websites top navigation, left navigation and as Footer links. All this links has to have occurrence of atleast twice or thrice from every website page. To my observation I found Google pick Sitelinks URL's mainly from Top Navigation & Left Navigation Link structure. Also to make a note Google display's maximum Eigth (8) internal webpages as Sitelinks, sometimes 3, 4, 5 and so on but not more than 8 for a domain. If you haven't thought of Sitelinks potential, give a second thought and think how you can improve your website navigation and qualify your internal website page's to get listed at SERP's. I strongly feel your website Google Sitelinks can help to improve quality traffic and conversion also your website will have the advantage of showing extra webpage's for a single #1 ranking. 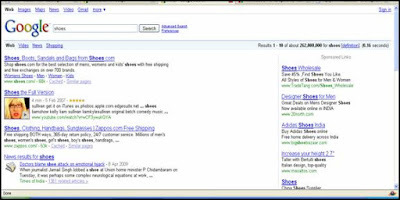 Sitelinks - Sitelinks are links to a site's interior pages. Not all sites have sitelinks. Google generates these links automatically, but you can remove sitelinks you don't want. Google Sitelinks are completely automated, and Google show them only if they think they'll be useful to the user. If your site's structure doesn't allow Google algorithms to find good sitelinks, or Google don't think that the sitelinks are relevant to the user's query, Google won't show them. Now let's assume Google is already displaying sitelinks for your website, but you want to block some of them or say you want to take control on which internal page's to display or not. So good news is you can manage all of your website sitelinks from Google Webmaster Tools dashboard, all you need to do is sign in to your webmaster account, look into the “links” section, you will see “Sitelinks” option out there. On webmaster tool Sitelinks manager dashboard screen you can control & block unwanted Sitelinks from showing under your Google organic listing. If you have enjoyed reading this article, please subscribe to TopRankSEO Blog RSS feeds, also you can Visit the blog page on Facebook to see who's following this blog.